If you need tile and grout cleaning in Newnan, call us today! Golden Glove is not just a carpet cleaning company, we also do tile and grout cleaning in Newnan! In this article, you will learn about tile and grout cleaning and the reasons why it is so important to have your tile and grout cleaned professionally. We also do tile cleaning in Peachtree City and the surrounding areas. Tile and grout are porous surfaces. This means that they are not completely sealed, there are small pockets of air. These holes allow moisture in and cause mold, mildew, and grime to grow. If you have dirty grout and tile, it is time to have it cleaned. The problem with dirty grout is that it becomes stained and discolored. You can prevent this discoloration by cleaning it often, however, even regular maintenance will not get your tile and grout looking like it’s first and original state.Our Newnan clients know that regular maintenance can usually keep the grout clean, but occasionally it will need professional cleaning. 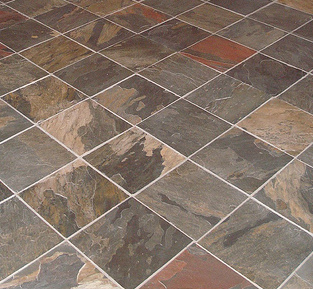 Our grout cleaning services will leave your tile and grout looking better than ever! How Do We Clean Your Tile and Grout? We use deep cleaning methods to get your grout and tile completely clean. We use specialized equipment, heat, pressure, and specific cleaning agents to get the grout clean. These factors work together to vigorously deep-clean tile and grout, then they flush away the soils to leave a sparkling finish. Mopping and scrubbing with cleaner and hot water will sanitize the grout but will not fix the discoloration that comes after a long time without cleaning. If you want to get your grout back to it’s color it was when it was new, call us! You will notice the neater looking tile and appreciate the difference.